The radio update went fine until it gave me a cryptic "file transfer error" which I am guessing is the firmware not being successfully loaded to the radio. I clicked the "update" button again, and then let it run. After 30 minutes it just kept saying "updating" so I just reset the radio. At that point it worked. Others have reported the same thing, so I guess that's a problem Flex will have to fix. I've already posted it on the Flex community forum to make them aware. The serial port feature is quite handy. First of all, it will only support genuine FTDI (Future Tech Devices Inc.) USB serial port adapters. Beware - there are many fakes which may or may not work. Flex sells an "official" adapter for $49 but I have bought UGreen adapters (which claim to be genuine and they work) on Amazon for $11 each. I got two for the CAT ports on the Expert 1.3K-FA. They work well. I also got a small powered USB hub so I can connect up to 5 devices to the radio (two USB ports on the radio plus 4 on the hub). Prior to all of this, hams used DDUtil or SmartSDR CAT to get CAT commands to their station accessories. DDUtil is still a great utility but it requires a running PC. It appears as though Flex is making it their goal to do an all-in-one remote solution, piece by piece. Nothing wrong with that. I've listed all the bits and pieces for a complete CAT cable set, but you may have stuff in your junk box already. The DA15P connectors come with the SPE Expert amps but if missing can be ordered from the links above or from other sources online. I didn't see any DE9S connectors with the amp, only a DE9P one for the management interface (which I use USB for anyway). Note: DE9 is commonly known as DB9 and DA15 is commonly known as DB15, and are in the family of standard density DSub connectors. P and S signify male Plug and female Socket respectively. 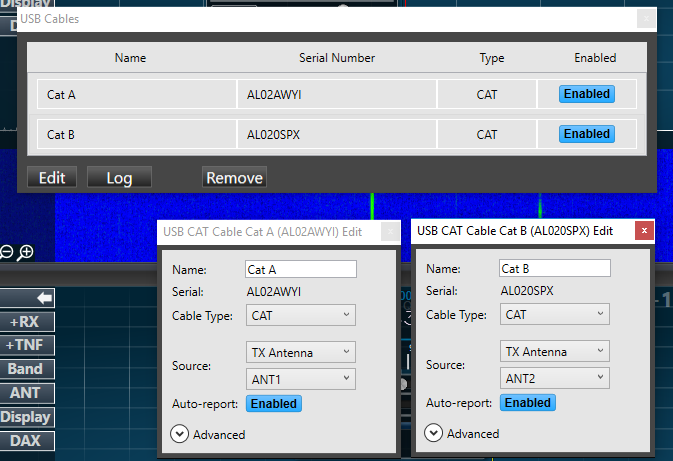 I've setup my serial ports as CAT ports to follow the TX slice for each antenna and I've named them CAT A and CAT B. This way you can do SO2R operation with one amplifier without having to assign a port to each slice (as I did previously with SmartSDR CAT). Additionally I use shielded cable and solder the drain wire to the metal shield on each end. I recycled 4 conductor cable left over from an old SteppIR EHU before it was sent back for repair but alarm wire will work. The "Advanced" setting in SmartSDR sets up baud rate and serial parameters but I've found that the default of 9600 baud is more than sufficient. As long as it matches the amp you should be fine. You can use either "Kenwood" or "Flex Radio" but using "Flex Radio" allows the amp to set drive power which makes things easier. I'll detail this in another post. I'm currently building the 5B4AGN TX BPF set and I'll be setting that up with band decoding and that will be covered in a future post. On a side note, while you can use a SteppIR SDA100 with a USB to serial converter connected to the radio, you do sacrifice some functionality and I leave that with DDUtil for now. I don't know if Flex will include full support for it in the future but it may be worth looking to for an "all in one" solution. When do you continue the SO2R setup description? I'm thinking of changing from K3's to Flex6700. Can your Step-IR manage SO2R or do you need two antennas? I sold the amp and I am going with a PowerGenius XL. SteppIR does not do SO2R. You need two antennas. Very nice job you have done with the documentation.